Rifkin offers up a utopian view of the future that draws heavily on Chris Anderson's Free and many of the other texts out there that show us salvation awaits us in our technology. Reading Rifkin's work now that it's been out for a few years and it does indeed feel dated. So many of the promises that were just around the corner still seem far away. The idealized sense that the internet will make us more collectively powerful seems lost amid the last few years of extremist politics domestically and abroad. Massively Open Online Courses as the cure-all for alternative credentialing in higher education still seems less viable and we will somehow become increasingly sustainable through these technological breakthroughs come across as stale in a world that still cannot get the facts right about climate change. Despite that, I would still recommend the book for anyone looking for glimmers of hope (after all, Rifkin's The Empathic Civilization helps me to frame the progress humanity has made despite what the news tells us) because there are ideas here that are worth holding onto. 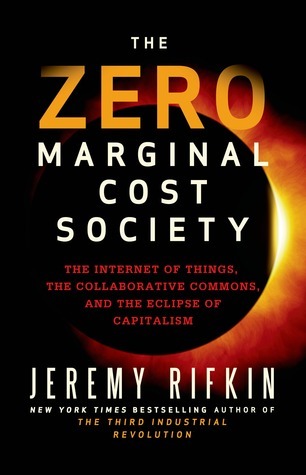 Sign into Goodreads to see if any of your friends have read The Zero Marginal Cost Society.